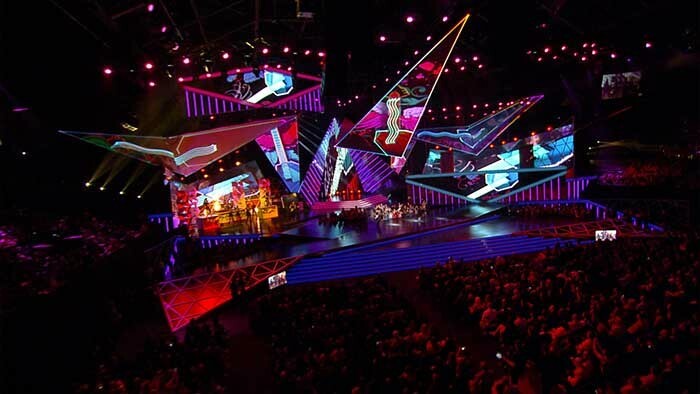 Two Avolites Media Ai Infinity 8 Servers and one Ai T8 server have powered the video mapping, projection, and LED screens for the Billboard Latin Music Awards in Miami - watched by more than 30 million people. Avolites Media Developer Ciaran Abrams worked closely with US-based lighting design and media presentation company DMDS7UDIOS on the 2013 Awards, held at the 7,972-seat BankUnited Center. 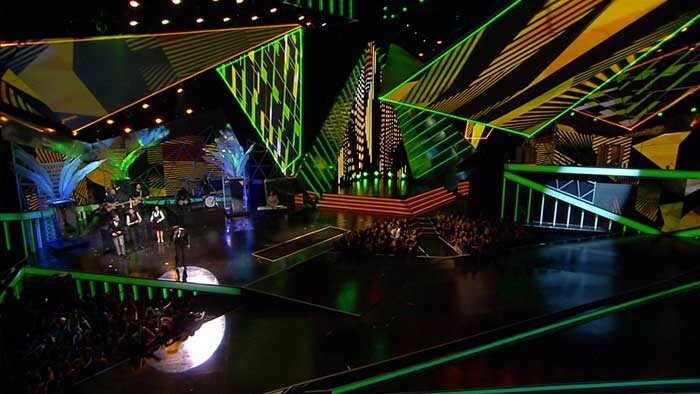 "Avolites Media's Ai kit was used to run every bit of video that was seen at the event - including the projection on the triangles and the video mapping for the 4 LED Screens placed in unusual geometry around the stage. We also video mapped MiStrip Led Strips at the back of the stage and several thousand MiPix designed into the set," says Abrams. "There were multiple systems outputting to 10 HD projectors and 4 HD LED setups, all controlled from one lighting desk. The whole show was pushing 14 HD outputs, which ended up being split across three machines: one for the LED, MiStrip and FLEX and two machines for the projections. The projections involved canvasses bigger than HD and edge blending of multiple projectors for the large triangles that were designed as part of the set." DMDS7UDIOS created and encoded all the content to our standard AIM codec and provided a lot of creative as well as technical material for this show which consisted of 14 live performances and a variety of unique awards looks. "Ai was chosen for this project because if its ability to both visualise in real time and deal with this very complex projection mapping, photometrics and amazingly high resolution video files," says Scott Chmielewski from DMD. "Moreover, the multiple and freely assignable outputs of the system allowed for tremendous flexibility in routing and controlling the unusual video surfaces and varying resolutions with ease. "Using true to life information for the projection mapping was critical to the success of the project. We were able to create custom software patches very easily to solve several technical challenges as well as provide numerous creative options that were simply not possible with any other media server. The Ai media server is quite simply next generation technology leveraging the most cutting edge software to manipulate video in unprecedented ways." The lighting designer was Jorge Valdez of Paradigm Lighting, with Miguel Cordero, and Ofer Zmora from DMD on team as content creators. "The team of developers and support staff at Ai have been amazing in helping us stretch the software in very flexible ways that we have not been able to achieve with other media servers," continues Chmielewski. "From the built in UI, the user defined project style and ability to control via artnet is truly what is setting Ai apart from other solutions on the market." Winners on the night included Enrique Iglesias and Jennifer Lopez, Rihanna, and Shakira. In picture: Ai was chosen for its ability to both visualise in real time and deal with the very complex projection mapping, photometrics and hi res video files.